Chittaranjan is a suburb of Asansol. As per 2011 census it is a census town in Salanpur CD Block in Asansol Sadar subdivision of Paschim Bardhaman district in the state of West Bengal, India. 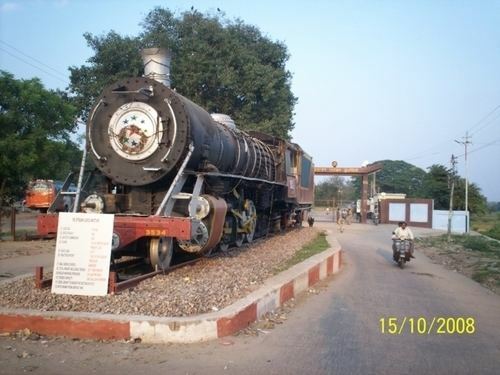 It is famous for Chittaranjan Locomotive Works, an Indian Government railway factory. Chittaranjan is located at 23.87°N 86.87°E﻿ / 23.87; 86.87. It has an average elevation of 155 metres (508 feet). Asansol is composed of undulating latterite. This area lies between two mighty rivers – the Damodar and the Ajay. They flow almost parallel to each other in the region – the average distance between the two rivers is around 30 km. Before development, the area was heavily forested and infested with plunderers and marauders. The discovery of coal led to the industrialisation of the area and most of the forests have been cleared. At the Western fringe of the area the Barakar forms the boundary with Jharkhand. There is a small stretch of land border with Jharkhand in the Chittaranjan area. Chittaranjan police station has jurisdiction over a part of Salanpur CD Block. The area covered is 18.03 km2 and the population is 39,205. As per 2011 Census of India Chittaranjan had a total population of 39,098 of which 20,089 (51%) were males and 19,009 (49%) were females. Population below 6 years was 2,769. The total number of literates in Chittaranjan was 33,601 (92.49% of the population over 6 years). As of 2001 India census, Chittaranjan had a population of 45,925. Males constitute 53% of the population and females 47%. Chittaranjan has an average literacy rate of 83%, higher than the national average of 59.5%; with male literacy of 88% and female literacy of 79%. 10% of the population is under 6 years of age. Chittaranjan is a railway town on the border of the Indian states of Jharkhand and West Bengal. The town is named after the Indian freedom fighter, Deshbandhu Chittaranjan Das. The passenger rail head serving Chittaranjan is located in Mihijam, which is in Jharkhand. The Chittaranjan railway station is in Howrah-Patna-Mughalsarai main line at a distance of 237 km from Howrah. Nearest important railway junction is Asansol, 25 km away. Most of the Patna, Barauni bound express trains coming from Howrah, Sealdah, Ranchi, Kharagpur, Tatanagar, Dhanbad stop here. The GT road or NH-2 passes 20 km south to Chittaranjan. By road it is well connected to Dhanbad (65 Km) and Dumka (100 Km).Road transports of both Bengal and Jharkhand can be accessed from here. A unique feature of this place is that the railway station is located at Jharkhand state (name of the place- Mihijam, district: Jamtara) whereas the township is in West Bengal. Almost 170 species of birds can be seen here. Chittaranjan is a heaven for birds. About 28 species of migratory birds visit this place every winter. Other animals like Jacals, Porcupine, wild rabbits, monitors and many species of snakes including Python and Cobra are also there. Chittaranjan is well known for Chittaranjan Locomotive Works (CLW), which manufactures mainline electric broad gauge locomotives. This factory commenced production in 1950; and up to 1972, it was involved in the production of broad gauge and metre gauge steam locomotives. Production of electric locomotives commenced in 1963. In addition to steam and electric locomotives, CLW also produced narrow gauge (762mm) diesel locomotives of the ZDM class metre gauge (1000 mm) diesel locomotives of YDM class and broad gauge hydraulic shunting locomotives of the WDS4 class. It also produced few special narrow gauge (2 ft, as in Darjeeling Himalayan Railway) diesel locomotives of NDM class. Production of steam locomotives was discontinued in 1972 when the last steam locomotive, titled 'ANTIM SITARA' (The Last Star), was rolled out. Towards the early 90s production of diesel locomotives in CLW was discontinued altogether. Today Chittaranjan is the largest maker of electric locomotives. Chittaranjan has been awarded a Golden Peacock award by Mr. Shri Lalu Prasad Yadav, former Railway Minister for the ISO-14001 certified green city which is generally called Swarg. The present staff strength of CLW is around 13,000 and it is probably the biggest unit of Indian Railways. In a total area of 18.3 km2, Chittaranjan has 9,356 residential quarters, 1 hospital, 7 health units, 8 community halls, 22 railway schools and 18 non-railway schools. There is 1 college, 1 club, 1 Kendriya Vidyalaya school, 7 markets and 2 cinema halls. Chittaranjan is the first planned township constructed in post-independence India. The township is divided into 8 areas and has an internal road length of about 193 km. Probably this is the only 100% pollution free and the cleanest Government owned planned township of India. Another rare feature present in this township is its underground sewage system- which ends up at the river Ajay after passing through a treatment plant which prevents any harmful contamination into the river water. No. of R.C.C. overhead Tanks : 30 nos. Total capacity : 30.32 lakhs gallons approx. No. of Tube wells : 194 nos. Kendriya Vidyalaya : 01 No. Burnpur Riverside School : 01 No. Chittaranjan, an ISO-14001 certified township, has neatly arranged row-houses, broad and clean roads, lots of greenery and lakes. The township houses over 9300 quarters of various types and sizes for its employees of CLW. All these quarters are neatly grouped under various areas, with each area having its own Primary Health Unit (also known as a dispensary), marketplace, primary school, community hall and playground. In addition to a dispensary in every area, CLW also has its own 200-bed hospital - the Kasturba Hospital. A bird's-eye view of a part of Chittaranjan Township can be had from Chittaranjan's own little hill resort - the diminutive HillTop, located within the town limits. Chittaranjan also has two big playgrounds: the "Oval" ground and the "Srilata" Ground, which holds various Sub-divisional tournaments. Chittaranjan has two multi-sports stadiums, two swimming pools, basketball court, badminton court, lawn tennis court, many football grounds, a gymnasium and one indoor stadium which is under construction. Across the Sunset Avenue a small hill called the Hollow Hill is an ideal getaway. The hollow hill is covered on all sides with water inside. It is an ideal spot for walking in the early evening and having a picnic. Chittaranjan has two movie theaters, the Ranjan Cinema and the Sreemati Cinema(not functioning anymore). While the former screens mostly Hindi movies, the latter screened Bengali movies and the occasional Hindi movie. Chittaranjan has many community halls where an annual Durga Puja festival is organized and celebrated. Ajay River — a famous picnic spot. "Hill Top" with a view the township. Horticulture Garden (near Hill Top). Railway Workshop, which is opened to public on 17 September every year on occasion of Vishwakarma Puja.